Gladstone Healthy Harbour Partnership launches third book! The next instalment in the Gladstone Healthy Harbour Partnership children’s book series is due to be launched this week. In the first two books, readers follow the adventures of Barry the barramundi and Jenny the mud crab. 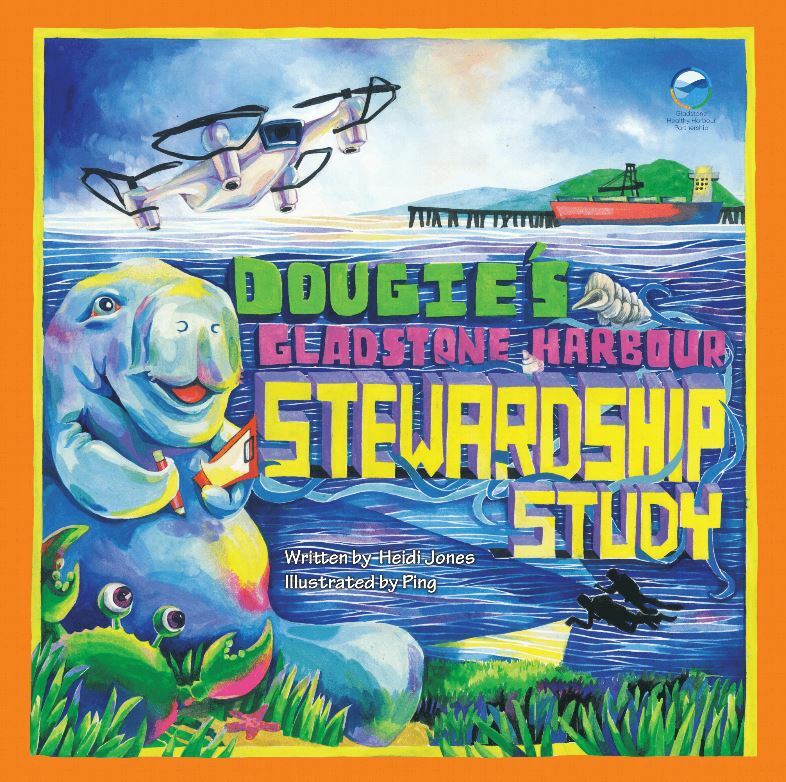 In book three, Dougie’s Gladstone Harbour Stewardship Study, readers will meet Dougie the Dugong and read of his adventures. The books are written by Heidi Jones and illustrated by local artist Ping Carlyon. The Gladstone Healthy Harbour Partnership’s book launch will celebrate how the government, industry and community help look after the harbour. Lyndal Hansen from GHHP said the focus of this book is stewardship. “GHHP is about monitoring and reporting on the health of the harbour. It reports under four areas which the community developed. These areas are social, cultural, economic and environment. These are all areas that the community has identified that they value about what harbour brings to us,” Mrs Hansen said. “The first book was about how we monitor the health of the harbour, the second book is about the scoring and results and this third book is about how our GHHP partners look after the harbour. GHHP defines stewardship as responsible planning and management actions,” Mrs Hansen added. In the new book, Dougie Dugong explores the ways different organisations meet their responsibilities of looking after our unique harbour. The book spreads the message of how proud we are of the harbour and the steps that the community and the partnerships within GHHP make to monitor and report on the harbour’s health. The Gladstone Harbour zone stretches from The Narrows south to Rodds Bay. Ping has illustrated all three books in the Gladstone Healthy Harbour Partnership series. The local artist who works from her home studio in Calliope. Ping has been creating art since kindergarten, she just loves painting and painting. “My mother always sent me to art classes and then I went to University and got an education degree, so ever since I have been painting,” she said. Ping said she had stopped painting after starting a family and it wasn’t until she was approached by the Gladstone Healthy Harbour Partnership with an idea for a storybook. “Without that, I don’t know if I ever would have picked up a paintbrush again,” she said. The illustrations in book three are painted with watercolours on paper. Ping said the characters, which feature in all three books are based on creatures that can be found in the Gladstone Region. “The colours I use are the colours we can see in the region, the locations are identified as being local, it is a wonderful way to teach the children about our harbour,” Ping said. The Gladstone Healthy Harbour Partnership has developed an educational resource kit to form part of the school curriculum. The activities and assessment pieces aim at increasing student’s awareness of harbour testing for students from prep to grade 12. The GHHP Education Resource Kit is an effective method to educate students and their families about how the health of the harbour is being monitored, and the kit utilises GHHP resources such as the annual Report Card and children’s storybooks to create a comprehensive package. The package is aimed at not only building the student’s knowledge of harbour health testing but also the scientific processes involved. The GHHP Education Resource Kit is providing an opportunity within the education system, for the community to gain an understanding of what is happening locally in the Gladstone region. Mrs Linforth added that the students also draw inspiration from the books’ artwork. “In Art, we use watercolours to create images similar to the books’ artwork by Ping. Our students loved making connections between what they saw out in the Gladstone Harbour and those illustrated within the colourful pages of the books. The cultural links included in the book are important to our Indigenous studies, giving value to the original owners of our Curtis Coast,” she added. The books are distributed to schools around the region and are often used as take-home readers, further spreading the message of the importance of keeping the harbour healthy.